I can say that about the area of town I am in. Right now, it's snowing, but nothing like Night Owl, Home Run Apple and many of the other east coast bloggers are about to deal with. There is maybe a half inch of the ground. Nothing, really. Also, it's quiet in the sports world around here. The NHL All Star game was yesterday, so still an off day for all the teams. The Bears sucked, so nothing coming on Sunday. Bulls are off. No baseball (obviously). I hope to start the Tis the Season mailings this weekend, so you that have won or signed up, you should start seeing some cardboard in the first week of February. Thankfully I almost through all the cards I have received, which has been a daunting task. I have one HUGE mailing to get to, that came completely out of the blue, but otherwise it has slowed down. I'm thankful for all I have received, but also I will have the time to work on some emails that have been sent my way. So for you waiting on cards, or a reply, I haven't forgotten you. Whatever your name is. 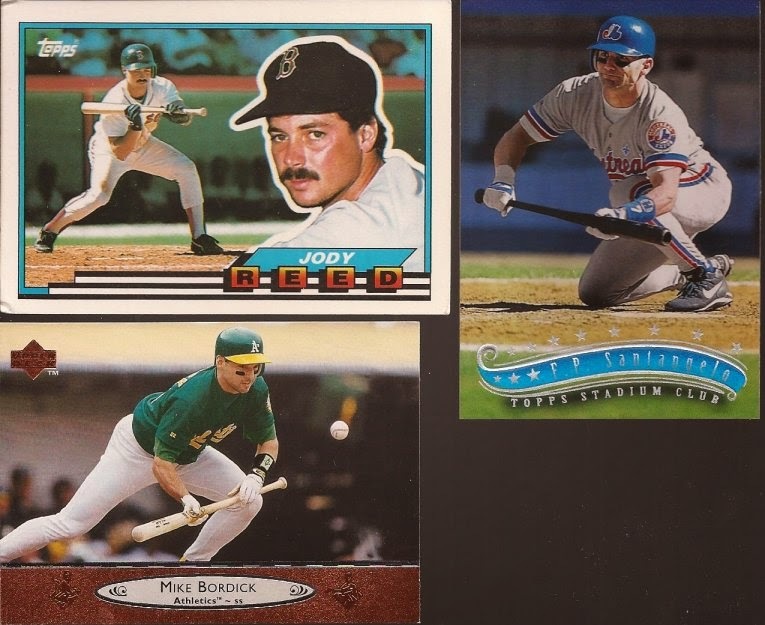 Here's a couple envelopes I received of players doing a lot on cardboard, but very very little in real life at this very moment. First, my dumping ground for Red Wings, Dennis at Too Many Verlanders, sent along a few Sox and Blackhawks. 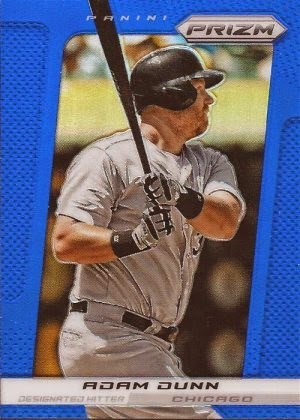 I slowly completed the Archives Sox card totally by trades - this Dunn was the last one I needed. 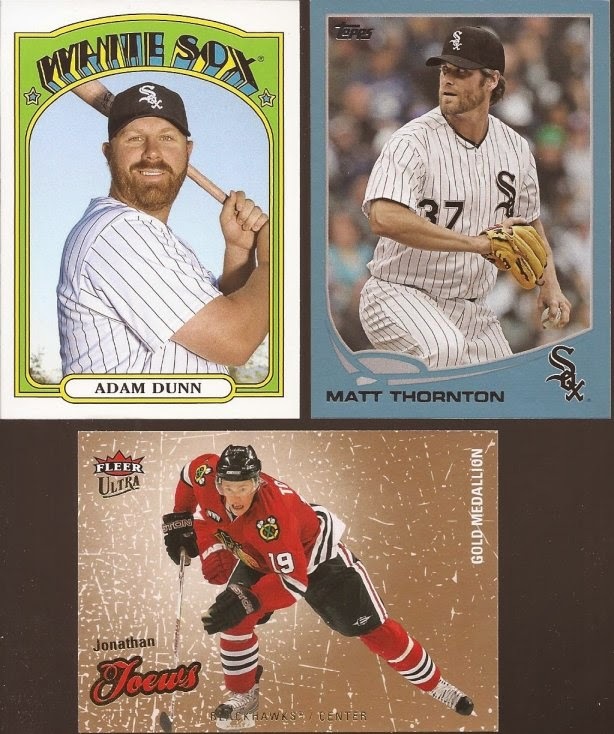 I think I have dang near all the Walmart and Target cards from last year, but I didn't have the Thornton. I'm sure that Toews was getting NO love in the Dennis household, so I will treat it like the precious rectangle it is. Dennis really nailed it with two Hawks autos. Though you can't read it, that's Enrico Ciccone on the left. Not a big career, going though 7 NHL sweaters in his career. But his job was a goon, as his 334 penalty minutes in 85 games with the Hawks will attest. The right, though - GRAMPA!!! 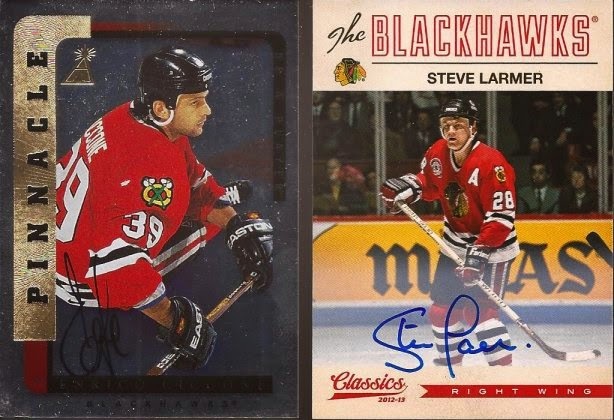 Larmer is that quiet guy that will get overlooked for the HOF, and that is a crime worse than a lot of baseball stars. ROY in '83, 3rd longest consecutive games streak all time, 1006 games played, 1012 points, 2 time All Star. 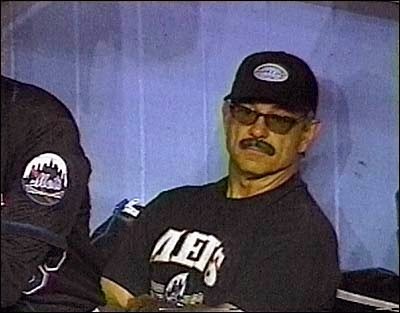 But I'll let someone else explain why Grampa deserves the call. Thanks for the cards, Dennis. There may be more Red Wings cards heading your way. The rest of the post is courtesy of AJ from The Lost Collector. It's always nice to have a Yankee fan in your address list. That team seems to get a lot of cards year after year. AJ dropped an envelope on me in thanks for the PWEs I have dropped on him. Love those Topps oversized cards, except when I try to put them in the binder. I am glad they are horizontal, so the 8 card pages fill the needs. Someone REALLY needed to lay down a bunt at the upper right. It's very very blue. And very very needed in the Sox box. Thanks again, AJ. Well, I thought it was quiet around here. Now I need to run to the store for the wife. Guess I spoke too soon. Very little snow here in WV, but the fam in NJ will be getting hammered. FYI, we're not getting any snow out of this storm. New York state is a big place. Glad you enjoyed the cards!